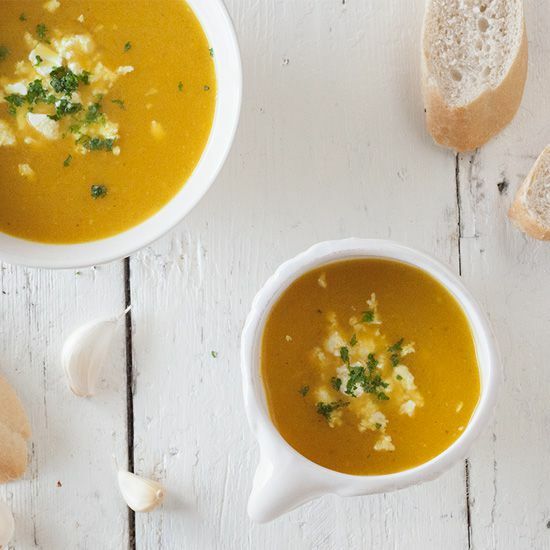 Roasted yellow pepper soup has so much flavor, it has lots of spices and even feta. Mmm! Also.. What's not to love about roasting peppers in the oven? PRE-HEAT the oven to 220 degrees celsius or 430 degrees fahrenheit. SLICE the peppers in halves and REMOVE the seeds. PLACE the pepper cut side down on the oven tray and DRIZZLE them with olive oil and add pepper and salt. ROAST them in the oven for about 30 minutes, or until they’re a bit blackened. Meanwhile PEEL the onion and garlic cloves. CHOP the onion and garlic cloves and set them aside. It doesn’t really matter how you cut them, we’re going to blend the soup anyway. Let the roasted peppers cool off until you can handle them with your hands. You can now easily PEEL the peppers and chop them into pieces. HEAT olive oil in the medium-sized pan and saute the chopped onion and garlic for a few minutes. ADD the roasted pepper pieces and saute about a minute more. ADD the cayenne pepper, ground coriander en chili pepper and saute for another minute. POUR in the vegetable stock and bring to a boil. Let it cook for a few minutes until the onion, garlic and peppers are soft enough. 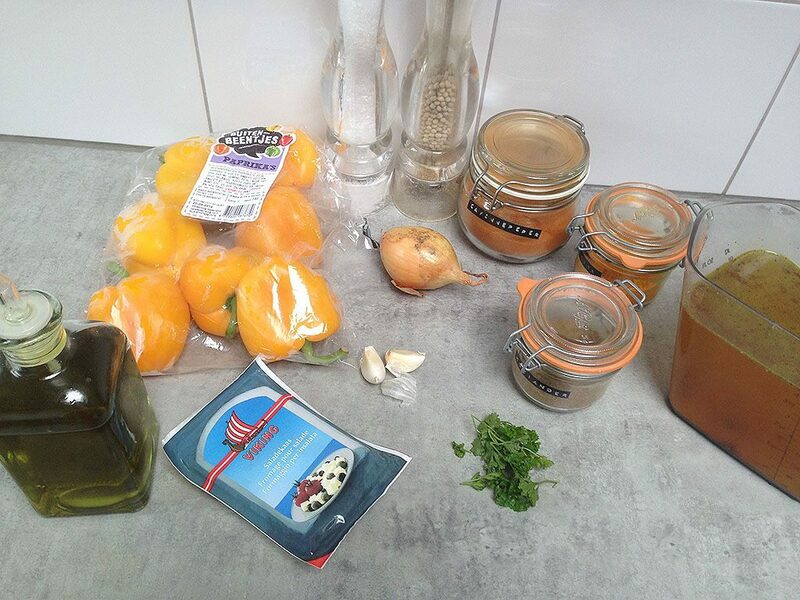 BLEND the soup and SEASON with pepper and salt. 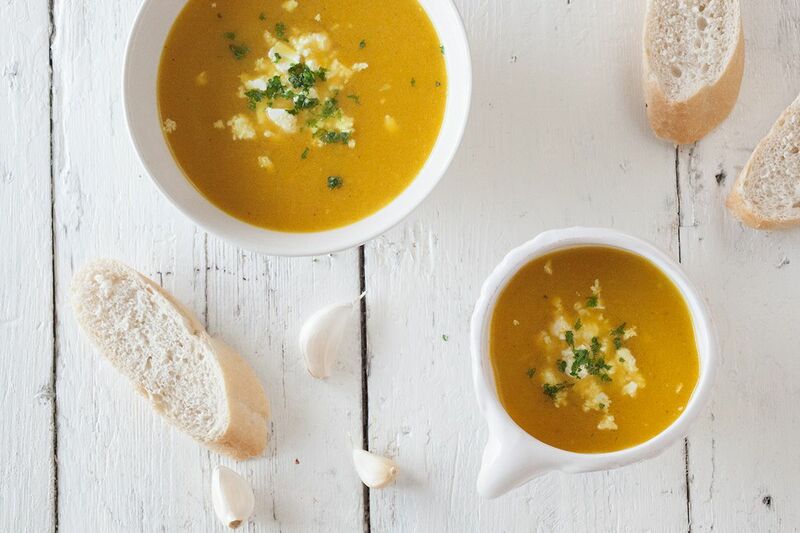 SERVE the soup with crumbled feta and chopped parsley and enjoy!